UPDATE: I'm free from the hospital. Thanks for the good wishes. Carry on. 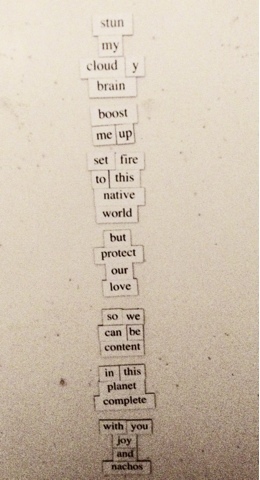 It’s still National Poetry Month, or I have renamed it: National Magnetic Poetry Month Using the Geek-Themed Set I found at Target for a Dollar in College. This was my attempt at romance but ended in a ode to food, as most poems do. This here below would've been the actual text if I'd had more prepositions/control of my brain. I NEED MORE OF YOUR ELECTRIC NACHO POETRY.